Well as much as I’m enjoying my summer, it’s going to be time to go back in less than a month. This is the time of year I start to get excited! I start finding myself driving to the Target dollar spot, Wal-Mart, and Office Depot almost every other day to get all the deals and spend way too much money! I am a total Periscope addict now and I consider myself an expert Periscope lurker. I am still too shy to go in front of the camera, but I will someday. Because of this new addiction, I have gotten so many more tips about hidden gems like the stationery section at TJ Max. I have now added that to my list of many stores to stop at and stock up. I am an office supplies addict! Anyway in thinking about what to teach that first week back I have decided to really zone in on what personal space is, what independent work is, and what partner work is and looks like. I have always taught it in the past, but now that I am doing Daily 5 in kinder, it makes it even more important to make sure that the expectations are really there all year. If not, Daily 5 can be very unproductive in the kinder room. I am going to talk a lot about personal space bubbles and how the students all have them. I have created an anchor chart that has these pictures. We will talk about how we find our personal space bubble around the room and we don’t invade others personal space bubbles. It was such an issue with my kinders last year! We will talk about working together is ok, but we still need to respect personal space bubbles. I will use these pictures as an example. I will also have the students model with me what to do, and what not to do so they know the difference. The final anchor chart to display in the room will look like this. We will then go on to talk about independent work versus partner/buddy work. A lot of times in my classroom last year the buddy work would get a little bit out of control. I feel I need to get WAY more specific and visual this school year about what buddy work is. 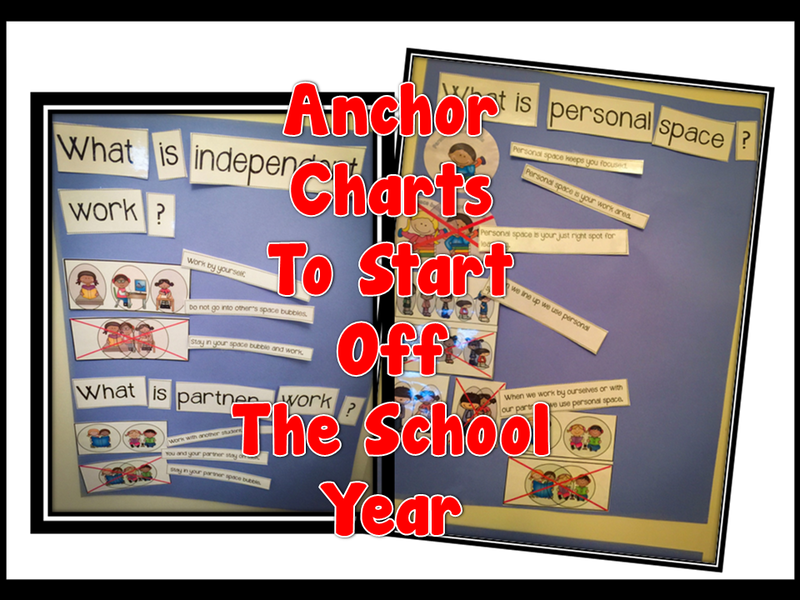 I created these pictures to go with the buddy work anchor chart. We will talk a lot about how we don’t intermingle with others also doing buddy work. I don’t want it to be mistaken for play time or recess time which I had a problem with last year. I also want get very specific about independent work at centers and just in general throughout out the day. I created this visuals to hopefully get the message across to my adorable five-year olds coming in this year. The final anchor charts for display will look like this. I will definitely use the first week of school to zone on this expectation, and we will build these anchor charts together and discuss. There is a little sorting practice page to do at the end of the week for extra practice. I am very determined to get these kids ready for their Daily 5 centers by week 8! If you want a copy of any of this here is the link to Ms. Murray’s TPT store.